In Oklahoma, fallout from an incident that ended with a reserve deputy shooting and killing a man after confusing his firearm for his Taser continues. It turns out the volunteer, Robert Bates, was carrying a weapon that was not approved for use in the field by the Tulsa County Sheriff’s Office. It’s also now clear that Bates wasn’t qualified to use the weapon, even if it had been. As real cops are now outnumbered 3 to 1 by security guards, volunteers, reserves, and others, agencies and municipalities would be wise to get their ducks in a row before the next PR disaster involving a non-cop and the use of deadly force. Former Sheriff Stanley Glanz insists that despite the fact that Bates gave the agency lots of money and presents, he never looked the other way, as far as training and firearms qualification. 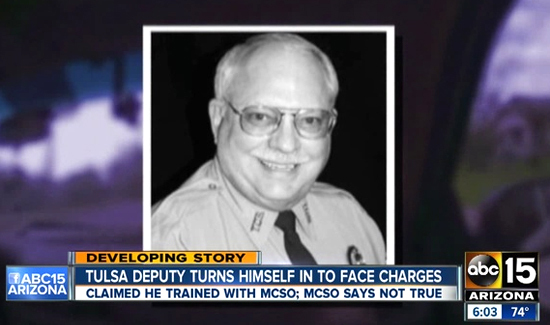 “I have never, ever waived any requirements for him with regard to his training or his position as a reserve deputy,” Glanz said. As the Chief Law Enforcement Officer for your agency/county and as an elected official the liability still falls upon your office. Why, as Sheriff you took a sworn oath to up hold your officer and you did not do that. Mr. Bates paid and purchase items for your agency via donations etc. Someone in the chain of command had to approve of his ride along and wearing of your agency uniform. Furthermore, someone had to know when he was working on duty. So if the county, city, Mr. Bates and Sheriff are not all sued it would be a miracle. This is exactly why all officers must attend POST required training regardless of who you know and what type of gratuity you give or receive. Now the correct thing for the LE folks to do would be to resign, and to apologize to the family of the subject who is now deceased. The next step would be to check with the IACP and your legal folks and develop a training and reserve deputy program if you need officers that bad. In my 25 plus years of service I have never made such a mistake. In fact they taser is plastic and weapon not so. I wish all involved learn from this incident and end your career on right and positive note. Pretty ridiculous and offensive of you in this byline free article to lump reserves in with security guards and volunteers. I’m a reserve. I actually have more academy training than the full timers in my state (California) do–1,000+ hours. I was also on field training over five times as long (completed over 2,000 on field training, compared with a required 400 for the full timers) . Yeah, this clown Bates got special treatment and shouldn’t have been doing what he was doing in multiple different ways. But that’s one huge black eye to reserves this year (by a guy who never should have been there in the first place)…but compared to how many by full timers? Bates was “a cop” under his state law and department policy–even if not in the eyes of the unnamed author of this article, or by me, because he was a crony and unsafe. The answer isn’t insulting all reserves with a broad brush–it’s ensuring state laws and department policies are what they should be and are enforced. Same as it should be (but often isn’t) for full timers.